By dragging the items in the menu from left to right, you easily Manage the content of your own channel. To the left a filterable list of all your programs. To the left there is a menu editor, managing your categories. On the far right, there is a complete customization panel for your channel, which includes a logo upload, a set of Themes and a bunch of color settings. Marqers can easily be dragged around and adjusted in size. 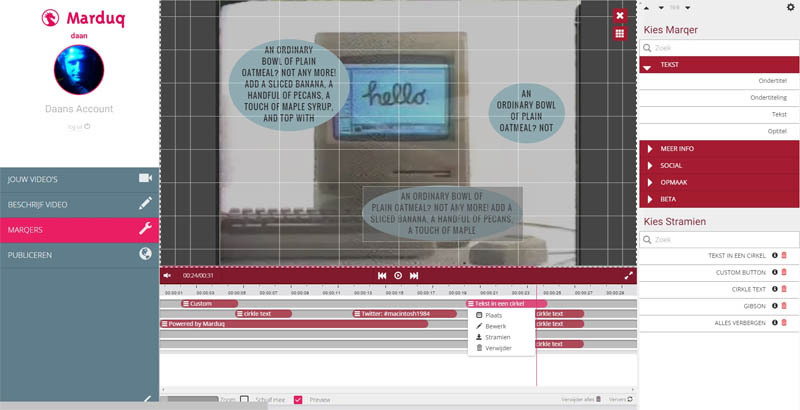 There is also a complete key-mapping with handy keyboard shorcuts. To the right there is a foldable menu with different marqers and marqer-prefabs.